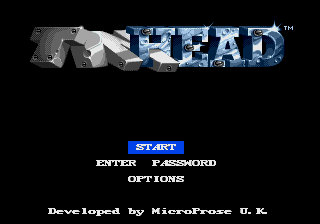 Tinhead is a 1993 platforming run-and-gun developed by MicroProse and published by Ballistic. It was released exclusively in the US for the Sega Mega Drive, though plans appear to have been in place at one stage to bring it to Europe, where it was set to appear in March 1994. You control a robot named Tinhead, who has to rescue the stars of the galaxy scattered about the planets by Grim Squidge while answering a distress call picked up by a space station. Tinhead's method of attack is shooting a ball from under his helmet in one of three directions with : diagonally up, straight forward, or diagonally downward/bouncing; use to change which direction to fire in. jumps. The game was re-released the following year, now with Spectrum HoloByte responsible for publishing.